Armitage & Associates Sports Chiropractic Group would like to recognize the recent achievement made by an outstanding Canadian chiropractor. Dr. Gotlib received the Order of Canada on Friday, May 3rd, 2013 for his excellence in Chiropractic research and advocacy. Dr. Gotlib has shown great passion for the practice and research of chiropractic treatment. His continued work in chiropractic and neuro-musculo-skeletal research has helped advance the profession to new heights. As the founder of the Journal for Canadian Chiropractic Association, Dr. Gotlib continues to advocate for the advancement of research and programs in the field of chiropractic care. Being the editor-in-chief of this publication for nearly 30 years has given Dr. Gotlib a sterling reputation in the field, one that is revered by many across the country. Dr. Gotlib has also been a President of the College of Chiropractors of Ontario, a full-time professor at the Canadian Memorial Chiropractic College (CMCC), and a member of the President‘s Voluntary Sector Committee at the Canadian Institutes of Health Research (CIHR). 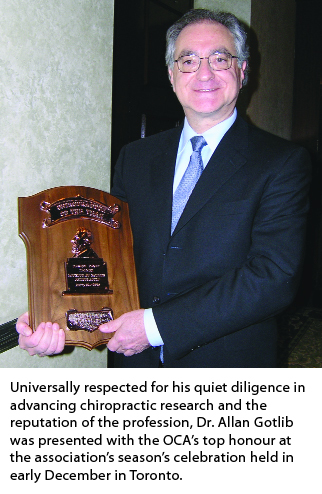 In addition, he has won several awards over his career, including the Earl Homewood Professorship (2007 and 2008) from CMCC, the Chiropractor of the Year Award (2006) from the Ontario Chiropractic Association, and the Canadian Chiropractic Association Medal of Merit (2007), which is the highest award given by the profession in Canada. A video of his acceptance of the Order of Canada is seen below.